CDC: 40 more cases in a Cyclospora outbreak linked to McDonald’s salads, pushing the illness total to 476. 57 Cyclospora cases have been reported in England, Scotland and Wales, of which 46 had travelled to Mexico. The source is likely to be a foodstuff distributed to hotels in the area. 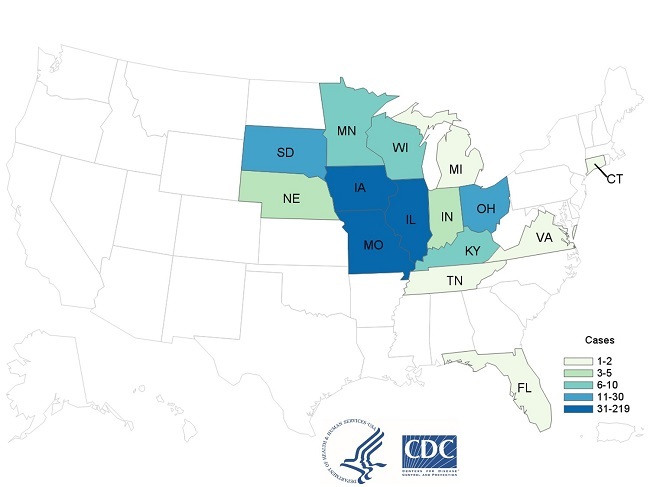 Cyclosporiasis Outbreak: People who reportedly consumed salads from McDonald’s and were infected with Cyclospora as of August 9, 2018 (n=436)*. The Public Health Agency of Canada is collaborating with provincial public health partners, the Canadian Food Inspection Agency and Health Canada to investigate locally acquired Cyclospora infections in three provinces. This notice has been updated to include 26 additional cases of locally acquired Cyclospora that have been added to the outbreak investigation. The Public Health Agency of Canada is collaborating with provincial public health partners, the Canadian Food Inspection Agency and Health Canada to investigate locally acquired Cyclospora infections in three provinces. The source of the outbreak has not been identified. Previous outbreaks in Canada and the United States (US) have been linked to imported fresh produce. The investigation is ongoing. The risk to Canadians is low. Cyclospora is not found in water or food grown in Canada. The parasite is most common in some tropical and subtropical regions such as the Caribbean, South and Central America, South and South East Asia, the Middle East, and Africa. In Canada, non-travel-related illnesses due to Cyclospora occur more frequently in the spring and summer months. Illnesses among travellers can happen at any time of year. Cyclospora infections can be prevented by ensuring you are consuming fresh produce grown in countries where the parasite is not common, such as Canada, the US and European countries. Cyclospora is a microscopic single-celled parasite that is passed in people’s feces. If it comes in contact with food or water, it can contaminate food and cause infection in the people who consume it. This causes an intestinal illness called cyclosporiasis. It is unlikely for Cyclospora to be passed from one person to another. In Canada, a total of 130 cases have been reported in three provinces: British Columbia (13), Ontario (115) and Quebec (2). Individuals became sick between May and mid-July of this year. The majority of cases (53%) are male, with an average age of 47 years. The investigation into the source of the outbreak is ongoing. To date, no multi-jurisdictional outbreaks of Cyclospora have been linked to produce grown in Canada. The outbreak investigation is active and the public health notice will be updated on a regular basis as the investigation evolves. People living or travelling in tropical or subtropical regions of the world who eat fresh produce or drink untreated water may be at increased risk for infection because the parasite is found in some of these regions. Most people recover fully; however, it may take several weeks before an ill person’s intestinal problems completely disappear. consuming fresh produce grown in countries where Cyclospora is not common, such as Canada, the United States and European countries. eating cooked food or fruit that you can peel yourself. People infected with Cyclospora can experience a wide range of symptoms. Some do not get sick at all, while others may experience more severe symptoms. Few people get seriously ill. When you eat or drink contaminated food or water, it may take 7 to 14 days for symptoms to appear. If left untreated, you may have the symptoms for a few days to a few months. Most people have symptoms for 6 to 7 weeks. Symptoms may go away and then return. If you become ill, drink plenty of water or fluids to prevent dehydration from diarrhea. If you have signs of illness and have reason to believe you have cyclosporiasis, contact your health care provider who may request a laboratory test to confirm the illness. Antibiotics may be given to treat the illness. What the Government of Canada is doing? The Government of Canada is committed to food safety. The Public Health Agency of Canada leads human health investigations of outbreaks and is in regular contact with its federal, provincial and territorial partners to monitor and take collaborative steps to address outbreaks. The Canadian Food Inspection Agency (CFIA) conducts food safety investigations into the possible food source of an outbreak.